Posted on July 21, 2016 by Tom Richardson Posted in Cell phone & Computer Monitoring Reviews . Mobistealth is another spyware on the market today, which allows you both Phone and Computer monitoring. This tracking software protects your kids and business 24/7. With the help of this spyware you can read all the text messages as well as emails on the cell phone, track current locations of the target device, view call details, and many other possibilities. What is more, with Mobistealth PC Monitoring Software all computer activities can be easily checked and spied on. This spying app is available only in English. Mobistealth has Blog and FAQ sections with the detailed description of the spyware’s installation and answers to all the questions which can arise. Moreover, you are welcome to write an email to the Ticket support. Also, the support team is available via the phone only from Monday to Friday (9 am – 9 pm EST), and only for those who have Pro subscription plan (with Live Chat the same situation). There are three subscription plans available by Mobistealth: Basic (only 5 main features), Lite (has more features than Basic plus Live Chat Support), and Pro (all features, support via the phone). Lite package costs 49.99$ and the minimum subscription time is 3 month. 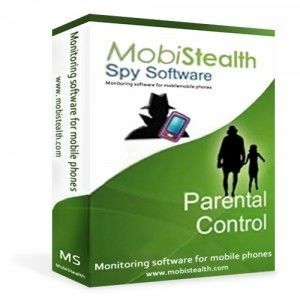 Mobistealth cell phone tracking and spying software supports iPhone, BlackBerry, Android, Nokia, and Windows Mobile phones (more detailed information about the phone models, you can find on the main website of the spyware). Mobistealth offers one month pre-installation money back guarantee in case you either can not install the app on the target device or you can not get access to the target phone. You can get a 15 days post Installation money back guarantee in case there are issues with the app. Nice parental control software. I was surprised how many features they offer. I heard about screenshots and call tracking before, but messengers and location tracking is something new. You can even monitor internet browsing. So, if my son visits entertaining web sites too often, I remind him of his classes and baseball training. The only disadvantage is that you can track only one device under one license. It’s not convenient because my kid uses IPad, a laptop and mobile phone at the same time. Maybe they have updated this, but when I bought Mobistealth only one license per device was possible. I’ve never used a cell phone monitoring software before, so I thought about its buying for a long time. I opted for the Mobistealth, the cost of the application is pretty attractive for the family budget. Moreover, Mobistealth user’s account provides many spying functions simultaneously. There is an opportunity to see not only text messages, but every call log and even video from the phone’s camera. Now I can keep my kids under control, because I can track their phones 24/7. However, there is a small disadvantage: I do not have always an Internet connection and can not log into my tracking account. It would be cool, if I get SMS notifications about the activities on the monitored phone. Never used it on a mobile device, but I use it on PCs in my office and my employees are aware of that. It makes me feel secure about EVERYTHING happening with personal info I share with my colleagues. My intellectual property is safe. Thanx. I’ve never tried spying software like this, but I’m quite interested in location tracking. A wonderful feature taking into account I have a teen son who never tells me where he is. Has anyone contacted their customer support? I’m curious whether this function is available in the subway or places with poor internet connection. Is the signal received over any distance? In order to get GPS locations from the target device, it has to have at least some internet connections, so that the tracking software could see the place and send it to your monitoring account.